Leave it to the government to create an app that is worthless and infuriating. Why do I even bother? 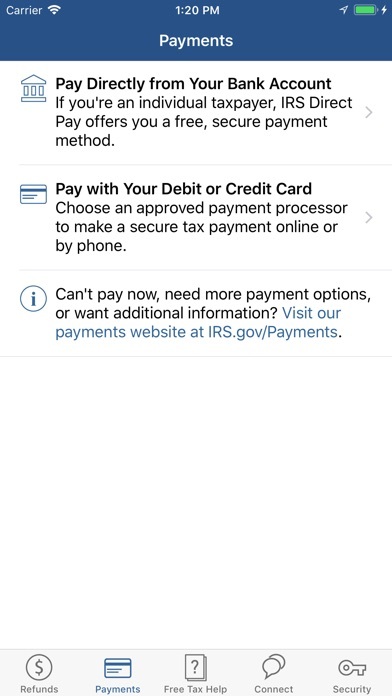 Has anyone received their taxes, but online still says the same thing?... mine hasn’t moved since 2 weeks ago! I was hesitant to download the app due to the recent negative reviews. Downloaded any way to give it a shot and it worked just fine. I got the same response as I did online. Maybe remove the app and download again. It doesn’t work. It keeps telling me my information is incorrect. I’ve checked my information multiple times. Still won’t let me log in. Mine has said “we have received your tax return and it is being processed” since the first week of February. My estimated refund date has come and gone. ??? This app is on point.. This app doesn’t work it keeps saying my information was entered incorrectly and I know for a fact it’s correct. Waste of time!!! Taxes done2 weeks ago. I keep getting an error code saying my info doesn't match. I'm looking at it, everything matches. First yr I have ever had an issue with the app. Not happy. I was locked out due to max attempts. The website never locked me out. Entered all information correctly and the app would just say “incorrect information entered”. Had to end up calling anyway. Spent so much time trying to register only to find out my address is entered wrong in their system not by my own mistake mind you. What’s the solution? No way to view Information about your account. Have to make an appointment and skip a day of work just to see my account balance at the tax office. 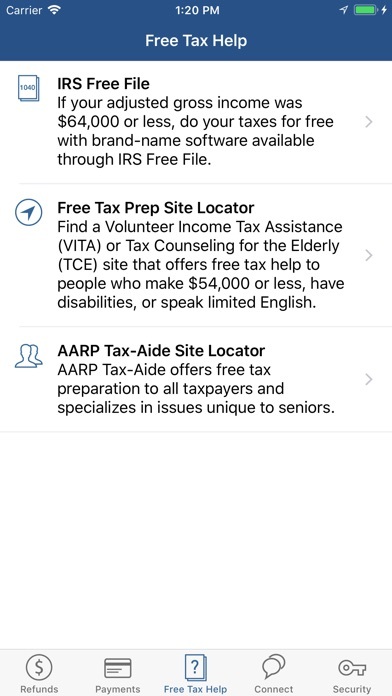 IRS is horrible to deal with on any given day, but I feel bad for people thinking this app will help or simplify anything. Why can’t the IRS just have a phone number like every other ordinary organization?????? Opened app. Put in info (3 things) and got an expected date and update of most current status. It’s exactly what I wanted and now to delete it until next year. If your a skeptic so am I, I wrote this for you. doesn’t give you the correct date at all! Really happy to know when I’m getting my return. Error message every time. Nope, it is not for me, will delete it. So if you try to check it more than once in a 24 hour period it will block you??? Quit trying to control everything. Kept giving me an error telling my my information was incorrect. I even triple checked to make sure I typed everything in correctly. I’ve used it for years. It works as advertised. You save a few seconds versus webpage. It doesn’t cure cancer. Half the complaints are from people who’ve had bogus returns filed under their SS#. Everyone should get an Identity protection number. Do the work one year and you’ll get the CP01A annually indefinitely. Or you can write negative reviews of convenient apps. To each his own. I can’t check my info or track my refund. It keeps telling me the information is incorrect! It has been two weeks since I submitted my taxes and it doesn’t give me the refund status of my taxes. What a crappy App. Works great! Not sure why some people have such a difficult time with this. Must be snowflakes that can't use their minds. Just think, these people actually drive! I enter all my information CORRECTLY but the app keeps telling me “information does not match.” Tried many times still with the same response. Simple, plug in your details reflecting your current years tax filings and get a quick update! Easy fast no time wasted ! Was concerned it wasn’t updated but it appears to work well for 2018 taxes. I tried the suggestions in these comments. Doesn’t work on the app or website. It used to though years ago so idk what’s going on now. Hasn’t worked for me the last few years. It’s been over a week since I filed, even received e-mail confirmation that my federal had been excepted, yet it keeps telling me that I have to wait 24 hrs, after confirmation email or it’ll say my information does not match. What a bunch of bull. I hurried and got them done, since it’s hard to tell if the government will shut down again, after next week, and now I’m getting nowhere with the status of my return. Followed simple instructions while looking at my electronically file return and app says input doesn’t match. Just a day too early. Works fine. The app told me at first that the filing information was wrong and to retry. It’s because I had the wrong refund amount. I was a dollar off. People were probably not putting in the exact information. It works regardless of the shutdown. This isn’t a scam site. Why is a message popping up on the app saying information is invalid but it pulls up on the website just fine? I enter all my information correctly, but I continually receive the message stating I’ve entered the wrong information smh. It keeps telling me that my information don’t match. I’ve used it before with no problem but this year its giving me trouble. I haven’t filed state yet but I did my federal. Did it to me last year too. I keep receiving a message that the information doesn't match when it does. I'm just going to delete the app and say the hell with using this useless piece of crap! I just tried to find my refund status and it gave me a message that it could not provide me with the info I was looking for (my refund status!) but that if I e-filed, I should receive my refund within 3 weeks. I’ve use this app for years now, and it has worked every single time until this year. I am currently getting the following message: “We cannot provide any information about your refund. If you electronically filed a complete and accurate tax return you should receive your refund in about 21 days from the received date.” Is anyone else out there dealing with the same issue? Please update...! Good app. I install once a year around tax time and delete after I get my refund. Very quick and helpful. I wanted an app to give me access to forms, instructions and news releases. 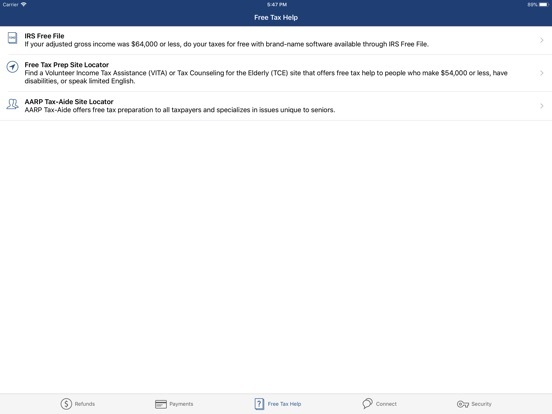 This is an app for tax dummies. If you owe Federal Taxes can you make payments through this app? Like everything else with the IRS, this app is worthless! I tested the app to check my refund and it was super fast told me the exact day it was direct deposited. What to do if I didn’t receive it. The free file information is super helpful. 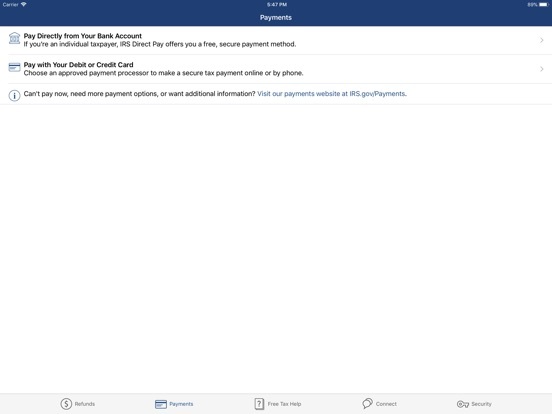 Payment information is easy for users to use. I think it’s very convenient for mid year items. Estimated payments and refund status. You can’t even download the app! Seems like it’s hacked. This app is trash.i have paid two months of my tax agreement and i just received a letter of no payments received.so where is my money going to? It doesn’t even work. It just gives me errors. I mean. If this is the IRS app, it should work right. It shows how incapable our government is. It’s a disappointment that I even have to deal with incompetence from something that could be so simple. App don’t even work, just like the rich.. When I check the status it says information does not match. That doesn’t tell you anything about what might be wrong. And I guarantee the information I put in is correct. All I get is an error message when trying to check tax return status. Tried 12 times with the same result. This year I was excited to see how long the estimated time was til I received my taxes. To my dissatisfaction the apps network is unreachable according to the prompt and been this way for the last two weeks. It worked last year, but what a disappointment this one. I input the correct information for each question and continuously get error message upon each attempt. Not beneficial at all. ex·tor·tion ikˈstôrSH(ə)n/ noun the practice of obtaining something, especially money, through force or threats. IRS need to be more moderate and provide more informations specially when faxing your missing forms to have proof of acceptance. The app doesn’t work!!! Error messages every time I try to use it! Pay attention, IT people! Fix it! The app doesn’t work. The website doesn’t work either. I get an error message saying info entered incorrectly but I know for a fact it’s right. Doesn’t matter if I use the .00 or not. 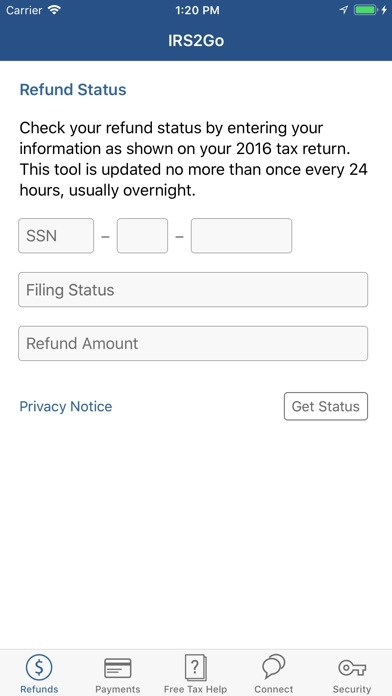 You cannot track the status of your refund with this app. 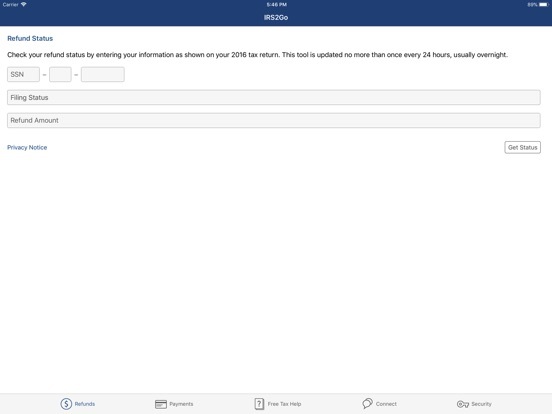 You cannot find out the date your refund will be issued to you with the app. This app is pointless and the IRS lied. Deleting. Every time I open it it’s either unavailable or just crashes. This is useless apps. After I put all my info, they asked me to call 1800 number for status. What’s the point to build this apps?? This app functions as advertised. It provides immediate access to refund status without diving into the IRS website. It does ask for the same information as the website, including the expected refund amount. But that is not a shortcoming because IRS needs some sort of specific marker to know what year one is inquiring about. Makes checking status of refund a little easier on the iPhone than using the web site. 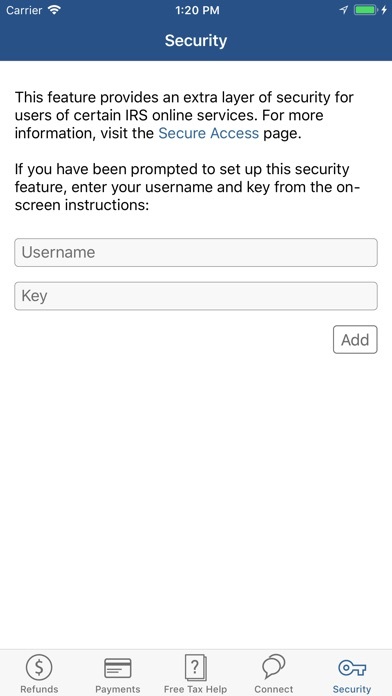 Same ID verification on both, but entering it via the app is easier because the fields are expecting numeric entry and automatically bring up the numeric keypad. Also the text is formatted for the mobile device so it's easier to read. 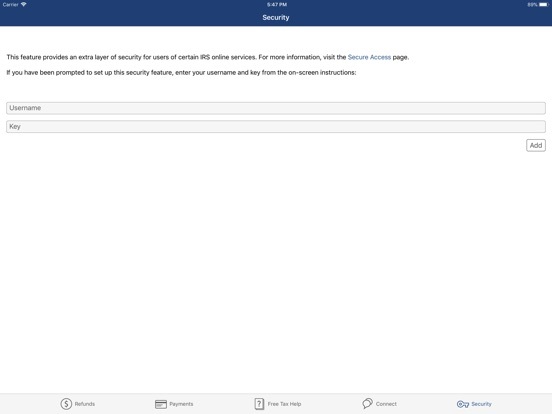 I can easily check my status without having to load up the webpage. The other review says the full website doesn't ask for full refund amount, and that is simply incorrect. Thanks for the app! Was able to track my refund from start to finish. It take 24 hours or so after the IRS gets your refund before you can check your status. Status updates happen once a day. I used and checked this app 2-3 times daily. After 21 days from filing(has to be 21 days before you can call and ask about status) called and was told selected for identification verification. App didn't tell me that or that I have to make an appointment to go in and let them physically see that this is me. Then wait up to 9-------I said 9 weeks to get our return after. Why didn't the app at least say to contact office? Don't waste space with this app! For those getting the "info not available at this time" message, make sure you type ".00" after you're whole dollar amount. This app does what it's supposed to. I had to resubmit my taxes due to an omission. Thought I would use the app to check on the progress and to be sure they received it. I keep getting the return error information. I used the suggestions from other reviews and still nothing I even entered the refund I already got and nothing! What am I doing wrong please help. I never commented on a app. First time!!! But this is a darn good app!!!! VERY accurate and no issues at all. I would def advise people to use this. And I will definitely be using this next year. Doing my own taxes. Very fast and accurate. I've shared this app with family and they state the same. Have used for the past 3 years and dead on EVERY TIME!! And giving the IRS 5 stars is hard to swallow. Simple and fast, more accurate than turbo tax!! I tried this app last year when I did my taxes. It just didn't work. I kept getting an error message. I try again this year and I get the exact same error message lol this app is a joke. Btw the website works fine. Really solid app that does what it's supposed to. No issues at all and told me exactly what I was needing to know. Works as advertised. It let me track my refund. If you just want to check the status of your tax return and have no refund due, this app will not work and you will be left to call, wait on hold forever and receive the same lousy customer support the IRS is famous for. This outfit is a national embarrassment.